Frequent questions we've gotten in the mail are "What is the Horror Writers of America?" and "What can it do for me?" The first issue of the HWA newsletter seemed like an appropriate place to reply to those questions, as well as to discuss the origin and future of HWA. Robert R. McCammon, author of They Thirst, Mystery Walk, and Usher's Passing, initially advocated the formation of a horror writers' organization two years ago under the name HOWL, for Horror/Occult Writer's League. HWA: Why the name change? McCammon: "The change was voted at the first official meeting of HWA at last year's World Fantasy Convention. I think it's a good change, because now the organization's title is more in line with The Science Fiction Writers of America and Mystery Writers of America. HOWL was too cutesy, anyway. At the time that name was suggested to me and I went with it, I knew the whole idea of a horror writers' organization was going to be an uphill struggle. Who was I to propose such a thing, anyway? It wasn't too very long ago that I knew practically no one in the field. The HOWL idea took its share of snubbing, and can you imagine the response if I'd said, 'Gee, boys and girls, how's about us forming the Horror Writers of America'? I don't think I would've been taken very seriously." McCammon: "Support for the idea at first came in from weird places. I actually got roped into doing an interview with Publishers Weekly about HOWL before I'd written all the letters asking the opinion of other professionals in the field, and suddenly I had reporters from The New York Times and Washington Post calling me. No kidding! The B. Dalton and Waldenbooks chains wrote me letters asking about it. European horror writers wrote me. Tons of people wrote me. Unfortunately, I'm the world's worst in answering letters and so I had these boxes sitting around until I could make the time to reply. But the response was incredible! I can tell you that horror fiction is stronger than ever, judging from the interest in what was at that time HOWL." HWA: What about interest from American professionals? Was it what you'd expected? McCammon: "I'd written a lot of letters to authors asking them their opinion, and most answered. Some of the big names did not, and I can understand that too. Again, who did I think I was to propose something like this? For all the other authors knew, this might be a big ripoff and wind up wasting their time. So there was a tentative but guarded interest. I have to say, though, that Dean Koontz volunteered his help right from the beginning. T.M. Wright was very excited about it, Robert Bloch offered his support at an early point, and many other big names in the field did too. I think the others had—and still have—a wait-and-see attitude and that's okay." HWA: Maybe the big names don't need an organization. McCammon: "Well, certainly they don't need HWA to sell their books. But another factor is that some of the most well-known horror writers do not want to be associated with the term 'horror'. At one point I was all for urging bookstores to set aside shelves for 'Horror' fiction the same as space is set for 'Science Fiction' and 'Mystery'. I got back the response from some authors that they'd rather be considered 'mainstream' and that the idea was detrimental to the kind of fiction we write. Well, I recently walked into B. Dalton's bookstore on Fifth Avenue in New York and there was a large display marked 'horror'! The thing about publishing is that everything is a category, even 'mainstream'. There seems to be a feeling even in our own quarters that 'horror' is undesirable, and that we ought to be trying to break out of it or move into 'mystery' or whatever. But horror fiction is not the same as mystery fiction, or science fiction! And calling a book 'mainstream' just means that it sells to a wider audience than a so-called genre work." HWA: So why should professionals who already know the markets and can sell their works be interested in HWA? McCammon: "Number one, HWA is not going to be geared primarily for beginners. It's going to try to hit a healthy balance between the professional and semi-professional. HWA should not be a fan club, nor should it be a clique with a closed center. HWA should be a support group for the professional and semi-professional writer, sort of a clearing house for ideas that would benefit not just the writers, but the field of horror fiction itself. Number two, HWA cannot survive with a membership of beginners only, because it's the pros who are going to give clout to the organization." HWA: Clout? What kind of clout? McCammon: "i know a lot of people who have been savaged by the publishing business, just completely torn up and their careers finished. 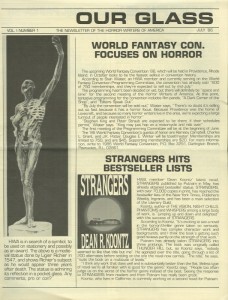 Up until now, horror writers have had no voice in the marketplace. Mystery writers do. Science fiction writers do. So do western writers, and certainly the romance writers do. Horror authors, nope! I'm not expecting any miracles, because writers are always going to be at the mercy of publishers, but the HWA can speak for the field of horror writers in a way that no individual can." McCammon: "Like determining if a publishing house is going down the tubes just before it buys your beloved manuscript and sits on it. Finding out if somebody's about to get ripped off before he or she signs the contract and it's too late. Avoiding bad agents, or, conversely, finding agents who have a true feel for horror. Only a tight organization with a lot of eyes and ears can know those things." HWA: Why not join the Mystery Writers group then? Or the Science Fiction Writers? Aren't there too many organizations floating around already? McCammon: "Name one organization for horror writers. Strictly for horror writers. Again, it's an overlapping of categories. But I, for one, don't consider myself a mystery writer or a science fiction writer. What do I call home? Where are there people like me? If I want to voice an opinion about something pertaining to my profession, where do. I send the letter? Up until now, I was out of luck." HWA: But what honestly can the organization accomplish? Isn't it more of a writer's club instead of a professional guild? McCammon: "HWA is going to be what the membership makes it. The first step, that first official meeting, has already been taken. Officers are about to be voted in. An editor and staff for the newsletter are going to be found. I can't say what HWA is going to be, but the framework is being put together right now. If you mean a writer's club in the sense of belonging to a group, yes. But I hope its direction lies in being a solid professional guild, because the promise of that is already here. It won't be easy, and there are going to be all kinds of people who say it's a pile of crap and everything else you can think of, but the promise of what HWA can be will only come true if writers put aside squabbling and ego trips and work it out together." HWA: So what do you think the future of HWA can be? McCammon: "A forum and a center of ideas and discussion. A power center for the field of horror writers, in terms of dealing with the publishing business. A focus on who we are and what we do. A way to set aside a relief fund so no horror author has to starve or sell off his library in his old age. A bi-monthly newsletter with up-to-date market reports and articles dealing with horror written by people in the field. An awards banquet and a yearly anthology of the HWA awards-winning stories. A connection to the community of European horror writers and film-makers. The way is open for all those things!" HWA: What about membership dues? How are those going to be used? McCammon: "Well, a treasurer is about to be voted in. That should give a focus to the raising and keeping tabs of funds. HWA is a non-profit organization, and it should remain so. Membership dues are going to be used for the printing of the newsletter and for the mailing fees. After the treasurer comes in, we'll know how we stand financially." HWA: Is there going to be a meeting of the organization this year? McCammon: "Yes, at the World Fantasy Convention in Providence, and I hope all of the membership can attend because that should be when the officers take over. I want to say also that HWA would never have gotten this for were it not for Joe Lansdale and especially his wife, Karen. She waded into those boxes of letters, answered them and started putting out a newsletter, and how she did all of it is way beyond me. If HWA ever gives an award far merit, it ought to go to Karen Lansdale because she's earned at least ten of them!"